Construction on Phases 1 and 2 of the Low-Line will proceed this summer, creating new plazas and a connected pathway between Lincoln and Ashland avenues beneath the CTA Brown Line ‘L’ tracks. 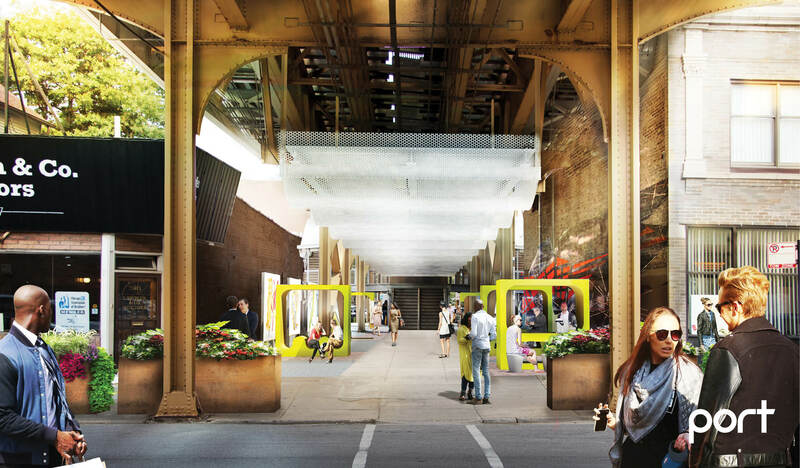 The improvements are part of the overall Low-Line vision, which re-envisions the underutilized area beneath the CTA ‘L’ tracks as an exciting Chicago art destination and a fun and dynamic path connecting Lakeview. Funded by SSA 27, Phase 1 will create new Low-Line plazas at Paulina and Ashland, incorporating enhanced lighting, seating elements, public art and pathway improvements. Phase 1 construction will begin in early June and run approximately six weeks through mid-July. The expectation is that these new plaza spaces at Ashland and Paulina will be connected in the fall as part of Phase 2, funded by Friends of Lakeview, which is kicking off a fundraising campaign to pay for the project. Some additional work will be needed to complete Phases 1 and 2 in 2019. A public meeting will be held early this summer at a to-be-determined date to solicit input on Phase 2 plans and to outline next steps. The Low-Line project was first introduced in the 2011 Lakeview Area Master Plan as a means of connecting the neighborhood’s unique sub-districts and beautifying the area for local residents while attracting visitors. The ultimate vision of the Low-Line is for a continuous, half-mile long art walk and garden stretching between Southport and Lincoln avenues. There is not yet a timeline or design for Phase 3 of the Low-Line, which would link Ashland to Southport, completing the project. To help ensure the project is properly and safely implemented with no major impacts to rail service, the CTA has agreed to assist with the construction of portions of the project, including site prep and installation, further emphasizing the important role the CTA plays as the focal point of communities throughout the city. Upon completion of the project work, SSA 27 will be responsible for maintaining the plazas, while Friends of Lakeview will maintain the pathway in between. No major impacts to Brown Line service are expected as a result of the project work, but the CTA and Lakeview Chamber of Commerce will work closely to minimize, and communicate, any potential impacts to neighbors. For more information about the Low-Line and project updates, visit www.lakeviewchamber.com/lowlinevision.